When something goes wrong with a home’s heating and cooling system, homeowners are often desperate to find a service provider that can not only remedy the problem quickly, but also one that they can trust to provide honest advice and value, without breaking the bank. 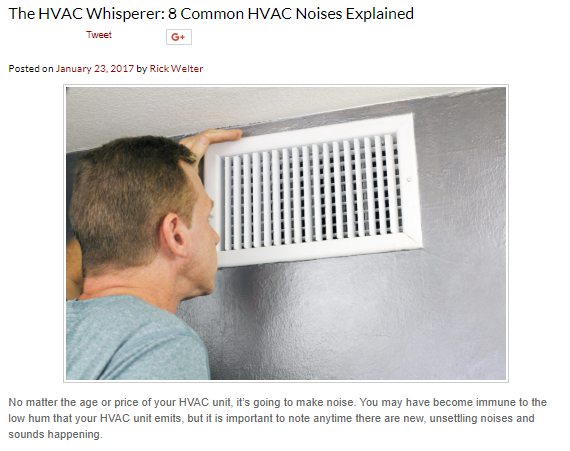 For more than a century, family-owned Ray N. Welter Heating Company has strived to be that trusted, friendly, local expert that homeowners can call on when their HVAC system is in need. But in a large market like the Twin Cities, there’s no shortage of competition in the HVAC space. Couple that with consumers often using the internet, social media, and online reviews to power their search for the best service provider, gaining and keeping search and community visibility can be a struggle. For more than a decade Welter Heating has partnered with TopRank Marketing to bolster and expand their local search footprint, showcase their expertise to prospective customers, and build awareness and trust in the Twin Cities market. From the beginning, we’ve seen steady increases in organic visibility, traffic, and conversions every year. But we’re always looking for more. So, we’ve been testing, refining, and keeping a close watch on changes in search to avoid stagnation. And over the last handful of years, we’ve seen some particularly impressive results. What were those results and how were they achieved? Keep reading to find out. Welter Heating has been keeping Twin Cities homeowners warm in the winter and cool in the summer for more than 100 years, with four generations of the Welter family taking part in the business. They’re a community business and proud of it—something we wanted to showcase. 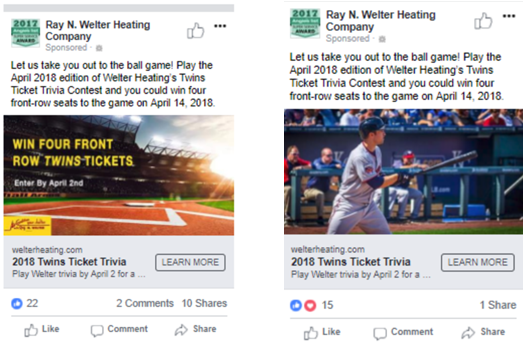 Launching the Welter Heating “Trivia for Twins Tickets” integrated social contest in the spring of 2016—something that has now become an annual tradition with giveaways three times a year. Capitalizing on broad and local search trends through the creation of the COOLest and HOTtest listicle series, featuring places, events, and activities our community members should know about. Optimizing and monitoring local listings through MozLocal. Regular optimization of priority website pages. Since the beginning of our partnership, creating best-answer content has been a big part of our strategic foundation. But as the way people search and how search results are served up continue to change, our content needs to change, too. So, in addition to our regular on-page optimization and SEO research, we conducted a mini content audit to identify repurposing opportunities and unearth content gaps. Looking at 18 months of organic traffic data, we were able to identify top-performing posts with built-in search equity and a clear topical niche. From there, we mapped other pieces to those specific topical niches based on keyword and search intent, bundling them into groups of content that could be used together to create robust resource pages. Overall, organic traffic is soaring year-over-year. For example, June, which is a top business-driving month for Welter Heating, saw a 400% combined increase in organic traffic between 2015 and 2018. As for organic conversions, we’re also seeing incredible results year-over-year. Building off our previous example, we saw a 590% combined increase in June between 2015-2018. More than 500 new users on average to the website entry page during each “Trivia for Twins Tickets” contest; accounting for 15% of total site traffic that month. 12% average increase in search impressions and clicks to robust resource content within the last 28 days. On average, 39 new, relevant keyword rankings for resource pieces in the last 28 days.